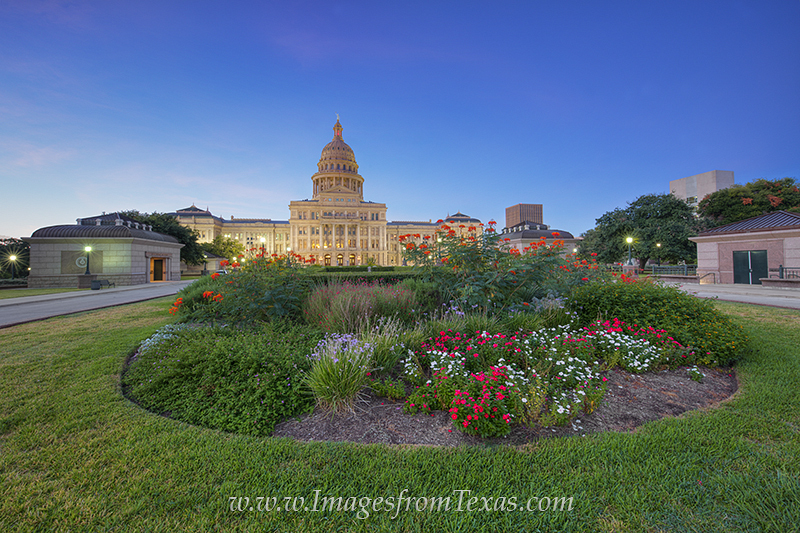 Flowers of orange, red, and white bloom on the north lawn of the Texas State Capitol near downtown Austin. On this portion of the 22 acres of land, visitors are treated to colorful views of the State Capitol grounds. The Capitol is a National Historic Landmark, recognized for this honor in 1986. With more than 900 windows and nearly 400 rooms, the building also has over 360,000 feet of floor space. It is a beautiful place to explore – both inside and outside. Flowers of orange, red, and white bloom on the north lawn of the Texas State Capitol near downtown Austin. On this portion of the 22 acres of land, visitors are treated to colorful views of the State Capitol grounds. The Capitol is a National Historic Landmark, recognized for this honor in 1986. With more than 900 windows and nearly 400 rooms, the building also has over 360,000 feet of floor space. It is a beautiful place to explore – both inside and outside. Photo © copyright by Rob Greebon.